At the time of this review, the book holds a 4.8-star review on Amazon with 1,526 Reviews. “Can Cinder, Scarlet, Cress, and Winter defeat Levana and find their happily ever afters? 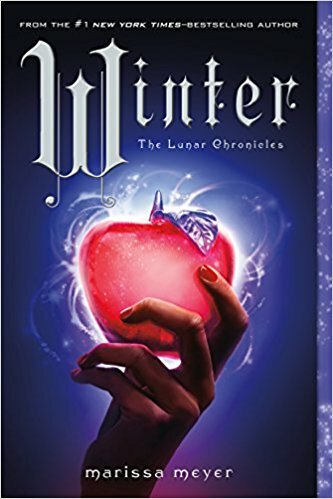 Marissa Meyer finishes the main arc of her Lunar Chronicles with this Snow White retelling, though she did write two other books that are part of the series (Fairest, about how Levana came to be the Evil Queen; and Stars Above, a collection of short stories). Just as with books 2 and 3, I recommend reading Winter after you’ve read all that came before. Meyer does spend a few paragraphs sprinkled throughout the opening to bring new readers up to speed on the characters, but there’s nothing like moving into the story immediately after you’ve read the others. Meyer does a fantastic job taking some of the hallmark details from each fairytale and sci-fying it up or giving it a fresh twist. I loved what she did with the poisoned apple; and being sci-fi, I expected where she’d take Winter in her “deep sleep.” Waking her took way too long for my tastes not because the story bored me, but because Meyer needed to tie off all the big sub-plots that had spanned the series. We’d seen Winter in previous books, but it’s this book that unveils the reason for her being the seemingly fragile character she is, and giving us the full picture now that we’re in her head. Jacin, a guard who took a small role in books 2 and 3, jumps into the fray in earnest in this book, leaving me no doubt at the depth of his love for this stepdaughter who, without glamour, outshines Levana. Their chemistry sings with the obstacles between them, not the least of whom is Levana herself. Because of his loyalty to Winter, I can never be sure who’s side he is on when the group’s aims (led by Cinder) could conflict with Winter’s safety. That’s the kind of tension I love, believable down to every nut and bolt. Take the way Winter looks at the world, a mix of trust and worry and love. She does whatever makes sense to her. “She pressed the pads of her fingers onto the screen and it brightened, welcoming her. The doors began to open, creaking on ancient hinges. When Winter turned back, Scarlet was staring at her, aghast. And how Meyer deepens Winter’s connections to animals, on the sterile moon made livable under the domes? Creative, delightful, and heartbreaking, depending on the scene. Her wolf friend, Ryu, steals every scene. Meyer doesn’t disappoint in working with the full cast, but it means the number of points of view (POV) bursts with supernova brilliance. Yet with each move, I feel that I’m in that character’s head without the dreaded whiplash some authors leave me feeling even as I lament the word choices that bump me out of the story—I’m a harsh critic when it comes to “saw,” “felt,” “heard,” and “smelled.” The spread of the POV is a clever technique, because tension builds as we move from sub-plot to sub-plot, and they blast into the main storyline—that attempt to wrest power from Levana and return the “lost” princess Selene to her throne upon Luna. This story, like the previous books, is as much Cinder’s as it is Winter’s. Because Meyer splits the cast up multiple times, then brings some together, then fractures others off, she keeps the pace humming along with that background dread—will each “princess” gain her happily ever after? Because, c’mon, what Meyer puts Wolf could break even an engineered soldier! The risks Jacin takes, and the times he decides to trust others? And how about Kai? I mean, he’s basically Levana’s prisoner, and now that she’s got him on Luna, his being Emperor on earth means nothing. I thought Levana and her Thaumaturges were bad, but then Meyer introduced me to more of the nobles, oh, my! I gave this book a lower star rating than the others because some parts of the story line felt artificial, more to draw out the conclusion or to make me better “feel” Lunar’s class schism, and how important it was for Cinder to break them from the stark life they’d been living, no better than the shells sentenced to death. It’s an author’s tough call, deciding how much of the story to tell. With 800 plus pages, Meyer tells a lot of story, and the cast grows to a thunderous size—after all, there are supposed to be seven dwarves who bring Snow White into their home, and tend her when she falls ill. Of the books, I connected least with these seven brothers because they did not stand out as those distinct personalities I so expect because of my Disney version of Snow White with Sleepy, Doc, Dopey, Grumpy. I did figure out Doc and Grumpy, but by that part of the book, I wanted it done. Which is the other reading for my lower rating: so many books, so little time, and when my mind finally says “this is dragging on,” the author has lost the deepest part of the reader-writer I am, no matter how inventive the society, the devices, the complications. Another reader with more time might give the book 5 stars because of the complexity and the way Meyer ties all those threads off, down to Winter’s weakness. I do have the final two books of the Chronicles—Levana’s story and the short stories—but I’m happy with the conclusion of the four-book arc. I’ll read those other two, someday, but in the meantime I’m reading a YA author new to me, and the clock’s ticking with my library checkout: Bring Me Their Hearts by Sara Wolf (a New York Times best-selling author). And I have so many other books sitting on my shelf, waiting for their turn. This entry was posted in Book Reviews and tagged amreading, Book Blogger, Book Review, Fairytales, Marissa Meyer, Science Fiction. Bookmark the permalink.